CUSEC, in partnership with FEMA, the Illinois Emergency Management Agency, and the Shawnee Preparedness and Response Coalition is hosting an earthquake mitigation training for hospitals and healthcare facilities in Marion, Illinois on April 4, 2019. 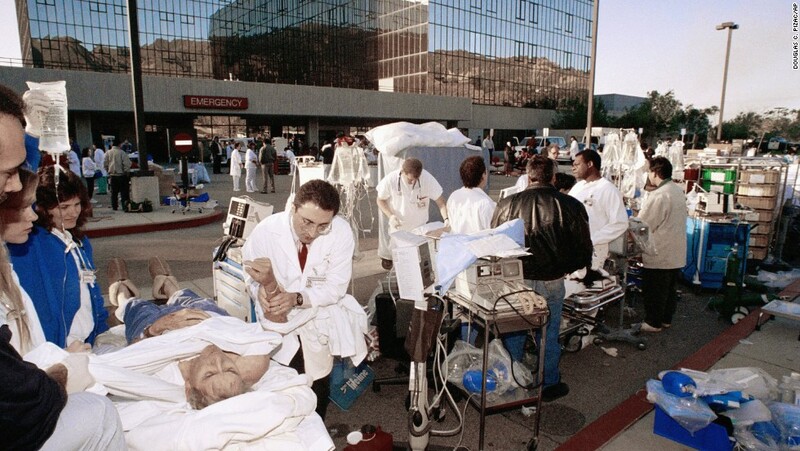 Medical personnel work a triage unit following the January 17, 1994 Northridge Earthquake in California (Photo courtesy Associated Press). FEMA’s P-767 Earthquake Mitigation for Hospitals training teaches participants how to reduce earthquake-related losses in hospitals and healthcare facilities. Hospitals and other healthcare facilities have unique nonstructural components, including equipment and infrastructure systems that can become sources of injury or damage during an earthquake. At the training, participants will be introduced to earthquake hazards and learn about methods to analyze and reduce risks of damage in hospitals and other medical buildings.By implementing sound, cost-effective mitigation measures, healthcare facilities can reduce seismic risks and ensure that, in the event of an earthquake, they can remain in operation to serve their communities. Note: Box lunch will be provided. Please list any dietary restrictions on the registration form.